Beany cookies are the new black. You know when you make yummy things and then you want to faceplant into all the things? Story of these cookies. Story of my life. At first I was going to share my Simple Truth recipe for Peanut Butter Banana White Bean Breakfast Cookies with you guys, but then I decided you deserved some fresh material. Cuz I love you that much. It’s true. And lookie here–now you have TWO fab cookie recipes to bake! The good thing about these cookies is that you can call the batter hummus and eat it all pre-oven. The other good thing about these cookies is that they’re totally flourless and made with chickpeas soooooo you’re basically eating beans AKA they’re basically health food. The other other good thing about these cookies is that you don’t need a cookie jar to house them in because they will surely all be gone by the time you find one. I know I tell you guys time and time again, but for the love of God, please make sure your banana is VERY ripe. Like black. Beany cookies are the new black, remember? Leave it to me to post a weird cookie recipe on National Oatmeal Day. Maybe I’ll make you turkey for Valentine’s Day. 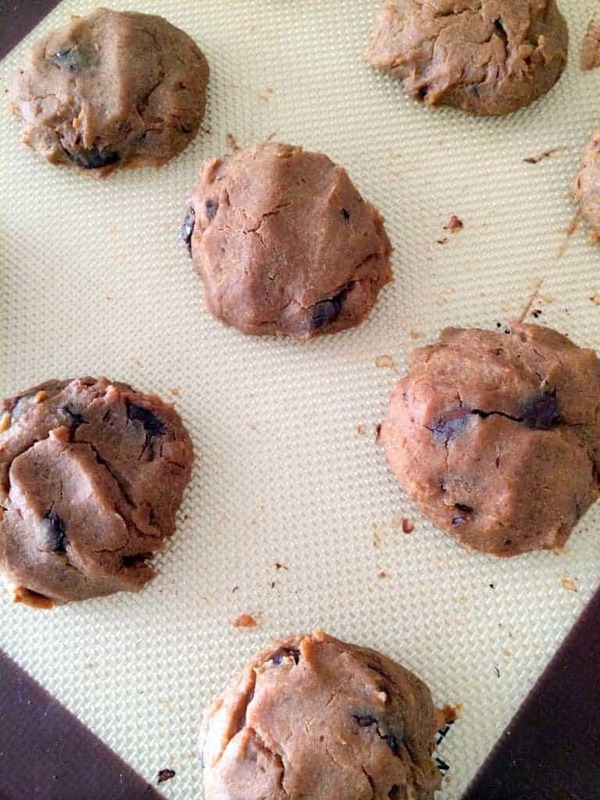 Grain-free peanut butter banana cookies loaded with protein and fiber for the perfect snack! Preheat oven to 350F. Spray baking sheet with cooking spray (or line with parchment paper or Silipat) and set aside. Make sure to rinse the chickpeas well so they don’t taste beany. Shake off the excess water before dumping them into a large food processor. Add in the rest of the ingredients (except chocolate chips). Process for a full two minutes, or until batter is very smooth. You may need to scrape down the sides. Stir in chocolate chips. With wet hands, spoon batter onto cookie sheet. It will be very wet and sticky (like hummus). You can use your wet hands to pat them down into smooth cookies. You should have about 16. Store cooled cookies in the refrigerator. *Feel free to use whatever sugar you have on hand if you don’t have coconut sugar. Is it just me or is the short nature of my posts recently directly correlated with the length of time until my thesis is due? Hmmmmm. Woa- the consistency of these cookies looks ab fab! I have never used nanas in a cookie before – brilliant idea Alexis! They’re SO moist. I swear, you could cook them forever without them drying out!! I’m impressed that you’re posting at all with a thesis coming up! I guess your mind needs a break, right? :) These cookies look perfect for my little ones! Love it! You are speaking straight to my heart with these! Can’t wait for my freshly purchased bananas to ripen so I can whip these up later this week! Glad to hear you’re on the bean bandwagon, Anna! Waiting for nanners to ripen is the WORST. Ohmygod I love you! I’ve made garbanzo bean brownies before but never cookies, and considering how great the brownies were, I MUST MAKE ALL COOKIES WITH BEAAAAAAAAAAAAAANSUH!! I need a stack of these on my desk today. Happy Monday, love! Ummmm let’s trade beany cookies for dark chocolate brownies!!! EEEEK I’m drooling. Guurrrlll I know you can appreciate the magicalosity (umm) of beans in cookies. You should indeed take some beano so there’ll beano gas. Indeed. Oh yes, I am all about cookies where I can sample the batter freely. Right?!? The magic of vegan baking, I tell ya. Hummus or cookies, hummus or cookies…..
Isn’t it amazing the things you can make with chickpeas!?! They’re such a versatile food! These cookies look to die for! I can’t wait to give them a try! It’s crazzzyyyyy!! I still think it’s weird to eat them in cookies, and look at me….eating like ten chickpea cookies every day! Please come make cookies for me. While you’re at it, I heard about black bean brownies and I’m all about eating cookies/brownies and calling myself “healthy” in the process. Only if they still also taste good, duh. Side note: I get really impatient when I want to make things waiting for my bananas to get ripe enough, so I appreciate the constant reminders. What would we DO without you!!!! Ummmm you know I’d love to. You need to make the black bean brownies I made for Simple Truth! I think I’m gonna have to post them on the blog for hummusapiens everywhere to see because they’re legit THAT GOOD. Black bananas = bomb. never had beans or bananas in cookies but i trust you friend. will have to try this soon. Glad you trust me, lady. These are a must-make! Hahaha my body may be getting a little tired of beans as well…beans in my veggie burgers, beans in my hummus, beans in my beanitos, beans in my cookies…BEANS EVERYWHERE!!! These sound SO good, Alexis!! I LOVE that they contain chickpeas :). I think I am going to make these for my coworkers and try to trick them and see if they notice ;). Thanks, lady! They’re super easy as long as you have a food processor to break down all those beanies! Okay, I’ve been skeptical to try the beanified cookies but you did introduce me to the apple pie smoothie, adding salsa and avocado to each and everything so this may have to make the kitchen table. The beaniefied cookie is kind of my favorite thing ever right now, next to the beanified black bean brownie that is. Beanified needs to be a work. Okay it is now. Thesis = killed. 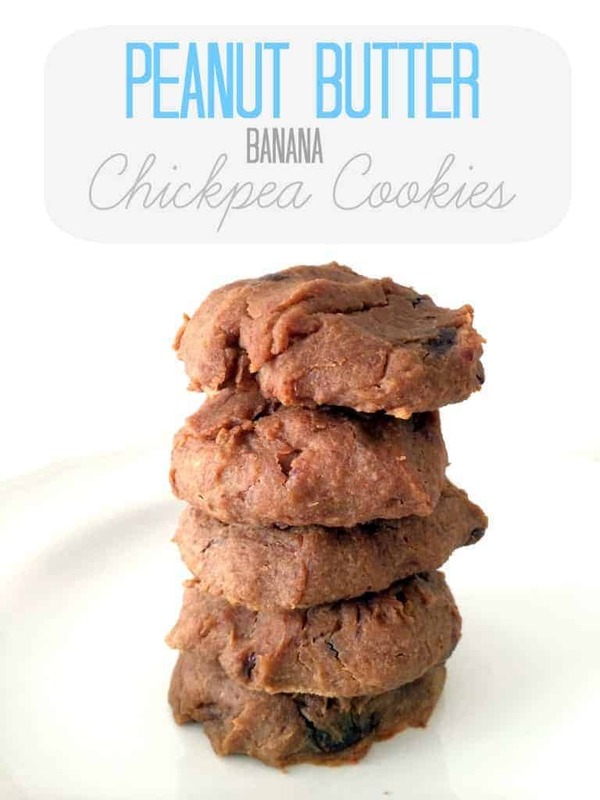 These look incredible, love the fact that they are made out of chickpeas, peanut butter and banana. Have to make these! Bahahaha I think I love you. It’s pretty mind-blowing. The whole time I’m like, wait–I’m eating BEANS!!! YUM, I will be trying these very very soon! :) Would chia seeds work in place of flax? Hey, Taylor! I think chia would work just fine. Let me know how they turn out! These cookies are GREAT! My new standby treat! I played w/ the recipe a bit: I added 1tbs of cocoa powder to up the choco taste (amazing!) and since I’m vegetarian (not vegan) and low carb & low sugar, I used only 3 tbs of light brown sugar (about 1/2, but still sweet!) and substituted 1 egg for 1/2 of the banana to lower the carbs (I used a ripe not over ripe). When the batter looked a little too runny I threw in 1 tbs of coconut flour to soak up the extra liquid of the egg (its a thirsty flour)… These turned out wonderfully! They taste like reese’s pb cups! THANK YOU!!!!!!!!!! Awww I’m so glad you enjoyed them, Michelle! I love that you added cocoa powder. Everything is better with chocolate!! Made these today and will be making these regularly! My 3-year old son who hasn’t eaten much of anything the last few days due to strep throat kept asking for one more. 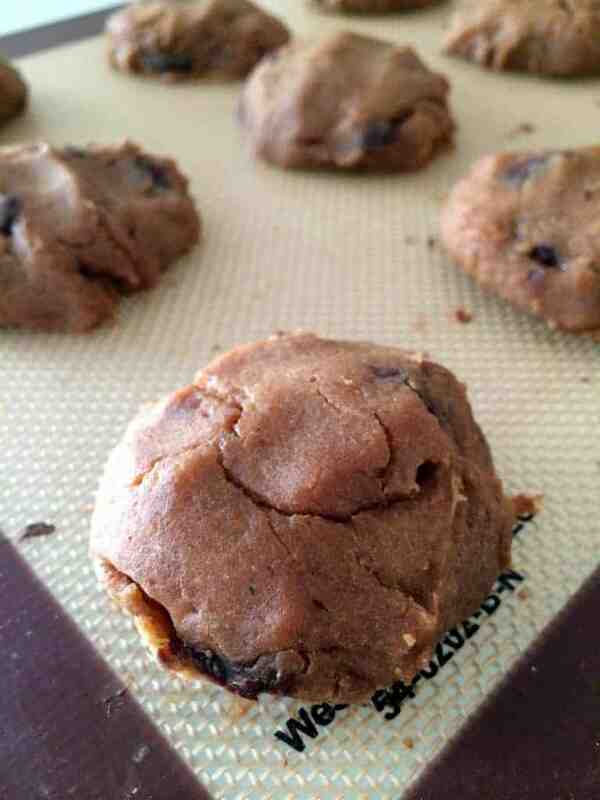 I substituted 2 TBSP agave nectar for the sugar and they were wonderful! Is there a reason you don’t use agave nectar in place of sugar in your recipes (I haven’t seen all your recipes, but was wondering if you use it or have a reason you don’t–Mine were probably more moist because of this switch)? I like to use a. nectar because it takes much less to sweeten and our bodies supposedly process it better. Thanks again! Aww your poor son! I’m glad to know that the agave worked! I honestly switch up sweeteners a lot, though I use maple syrup mostly. Using a liquid sweetener will definitely make them more moist, though. Agave has a lot of conflicting evidence on whether or not it’s “healthy,” so I honestly just stick with pure maple syrup or coconut sugar if it’s a dry sweetener. I think focusing on the least processed sweeteners in small amount is the overall message here :) Hope that helps!! These sound fabulous! Question: I have some chickpea flour that I would really like to use up…..I’m wondering if is it possible to substitute for the beans? If so, any idea on the appropriate amount of flour? And would I need to add liquid as well? Thanks, Jen! Hope you love them! lAhh love this recipe because you used coconut sugar and I LOVE to sweeten my dessert recipes with that stuff! It’s a great alternative to refined sugar and it still adds great sweetness! Now I just have to wait for my bananas to ripe so I can make these! Yayyy! I just ran out of coconut sugar and I’m kind of crying about it. I might try making them omitting the sugar? Hopefully they’ll still be good! I made these delicious mounds of goodness tonight but made a few substitutions. I try not to eat any refined sugars and am off peanut butter for a while (was eating it by the spoonful). I used organic sunflower butter, vega “va va vanilla” protein powder, two medjool dates (soaked for an hour), used lexia raisins instead of chocolate chips and added a bit of ground cardamon. I ate most of it out of the food processor; such an amazing recipe! I love using beans in treats! Ok I’m making these this weekend and venturing into the land of beanified cookies. Kind of excited! Actually, really excited. I think I need to give the black bean brownies another go – maybe I didn’t rinse the beans enough the first time? Maybe it was just a mental thing, who knows. I wasn’t as into them as I wanted to be. :( But I’ve heard such great things about chickpea cookies AND you know I love anything peanut butter. Or almond butter. Or sunflower seed butter. Or cookie butter. Or butter butter. Also, why do beans get so foamy when you rinse them? Weird. Another weekend, another cooking/baking frenzy. Yessssss. Yes–make them! My roommate just made my ultimate black bean brownies from Simple Truth–they’re seriously amazeballs times a gajillion. Make sure you blend the heck out of the batter. It should be completely smooth. As far as the foam, I think maybe just from being in the can so long? Not sure! Sometimes making cookies can sound overwhelming. This recipe does not have too many ingredients and making it in the food processor is fun :) I don’t have any intolerance to flour or eggs. I did add an egg and as a final step I dumped in about a cup of flour to the recipe just so the dough wasn’t too mushy. I also upped everything a little because I used a 19 ounce can of chickpeas. After one day, they were even tastier. Today they are serving as a breakfast substitute! Thanks for the recipe! Wow–sounds like you made some awesome substitutions! So glad you like them, Cindy! How about sunflower seed butter? My husband made these cookies one day and I ate like 7 at one time! I was AMAZED that he made them, as he is not a baker. I couldn’t believe how delicious they were. You see, my husband appreciates that I cook healthy food (I don’t drink or eat milk, no red meat, no poultry, mostly organic, and I eat fish) and I turned him onto some great recipes I found online. Although he has no restrictions to his own diet, we both LOVE trying new types of food. Anyway, he said that he came across your recipe online and had to try it right away…I AM STILL amazed b/c they are so delicious for how EASY they are to make! THANK YOU. THANK YOU. THANK YOU. I had all of the ingredients on hand and a sweet tooth so I just whipped these up – yum! I don’t feel too guilty because of the reduced refined sugar and mostly clean ingredients plus the texture is awesome! :) thank you!! Hey Elizabeth, I don’t post nutrition information as I’m not an advocate of calorie counting. Thanks! Amazing recipe! I used almond butter instead of peanut butter and it still came out amazing. We make this all the time! My husband and I have lost a combined 130lbs. This is one of our favorite sweet treats right now. Great recipe- everyone asks for it!